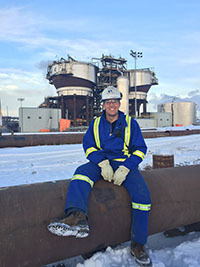 Connor was pursuing a BSc in Materials Engineering at the University of Alberta when he started an 8-month co-op with Canadian Natural Resources Limited in Horizon Operations on the Bitumen Production (BP) team. “The best thing about starting a career here is how fast you get fully involved… You don’t have to be a senior employee for your ideas to be heard.” – Connor. Project Engineer, Canadian Natural Resources Limited. There was also room for fun. One of the highlights of Connor’s time with Canadian Natural was a trip he took with his team to Fort McMurray in the summer. He recalls it as being one of the best summers he’s had, with his days filled with canoe trips, camping, and hiking. He joined a new Engineer in Training (EIT) program at Horizon. As part of his program, Connor spent 4 months in the Operations group, where he did a lot of hands-on work in the field. He says that this work helped him develop technical knowledge, as well as a personal network across the company's operations. Connor has learned a lot during his career with Canadian Natural. He’s gained extensive technical knowledge from his time working in the field. As a result, he’s much more effective in his new role.